International Journal of Research in Health Sciences,2013,1,1,28-33. 1 Professor in Ophthalmology S.V.Medical College, 2Senior Resident, 3Assistant Professor S.V.Medical College Tirupati, Andhra Pradesh, INDIA. The role of ocular injuries in causation of blindness has been a subject of immense importance and will remain so because of the rapid industrialization and mechanized farming which is coining up in our country. Cross-sectional observational study. Patients attending the outpatient Department of Ophthalmology, SVRRGG Hospital, Tirupathi with a history of Ocular Trauma. A total of 187 patients with mechanical eye injuries have been enrolled. In the present study, 73.8% were male and 26.2% were female. 56.1% belonged to 15-45 year age group. 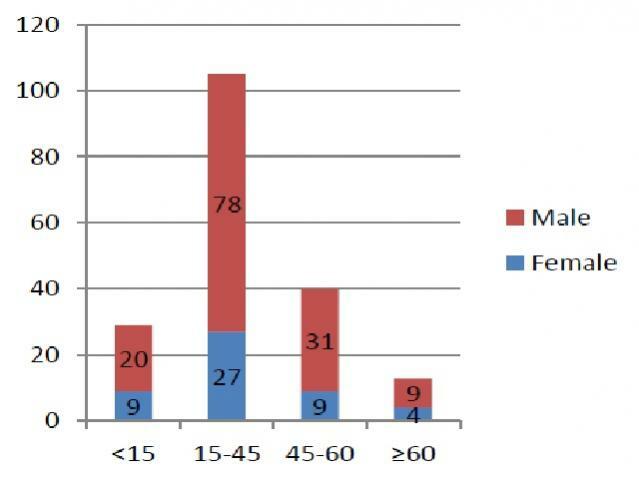 In both male (56.5%) and female (55.1%) maximum number of ocular injury cases were from 15-45 year age group. 70.1% were from urban area and 29.9% were from rural area.